Don’t force down prune juice or go on a watermelon diet to ease digestion. Let’s leave those old wives’ tales in mists of time and eat delicious ingredients right from our nearby farms and orchards, incorporating them in a delicious hash to boot. I’ve turned to hashes as my go-to brunch plate. Whether I’m at a restaurant with friends or using up an assortment of fridge and pantry items for a homemade jumble of chopped up ingredients. I learned from the menu at Founder Farmers to add a little savory meat. By taking a leaf out of their book, my hashes are even more flavorful and savory, with that added protein we need in the morning. I especially like to add fruit. I don’t eat enough fruit, especially in the winter, as I’m craving hot food. Now I can heat up soft fruit and add crunchy things, too, for a plate that looks like an homage to autumn. 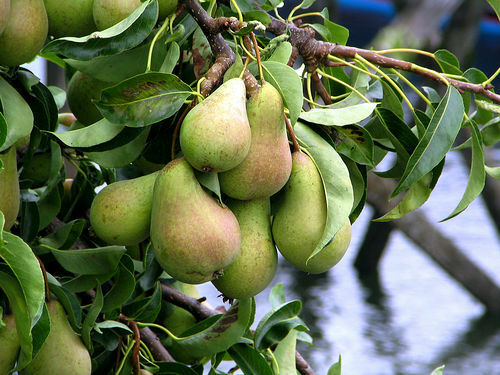 I’m nuts for pears and their soothing effect on our tummies. Since pears have a low acid level, we can easily digest this fruit. Keep the skin on the pear and eat one whole fruit to attain about 20% of your recommended daily fiber need. And another benefit: the pectin, which is water soluble fiber, is diuretic and has a mild laxative effect. Win, win, win! Leaving the skin on potatoes also adds more fiber to our diet. So pears, meet potatoes! Potatoes have both soluble and insoluble fiber, helping your gut feel full as pears do and helping with the passage of food through your digestive system. 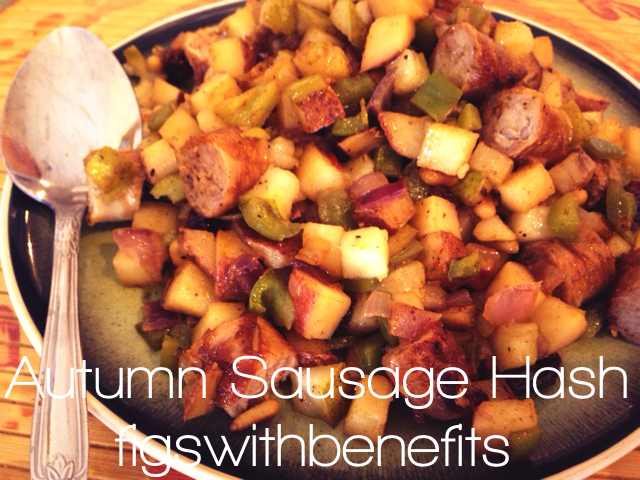 Besides, a good hash must have potatoes (and pork, in my book)! Toast pine nuts: in a small frying pan, add pine nuts and toast over medium-low heat. Shake pan or stir around nuts every minute or so in order to toast nuts evenly. Once brown and you can smell them toasting (about 3-5 minutes), remove from pan and cool in a small bowl. In a large frying pan, add stock, cardamom seed, cloves, and cinnamon stick. Bring to a boil, then return to medium heat. Add sausage and cook until just cooked through, about 4 minutes, stirring occasionally. Add potatoes and red onion, cooking for 10 minutes. Add green pepper, cooking for another 5 minutes. Add pear and toasted pine nuts, cooking for 5 minutes longer. Stir occasionally throughout cooking. Always season after adding any ingredients, adding salt and pepper (only about 1/8 teaspoon pepper and 1/4 teaspoon salt each time, for about a total of about 1/2 teaspoon pepper and 1 teaspoon salt total, or per your tastes). Remove from heat and add sweet chili sauce. Stir to mix well. Serve immediately. I used breakfast sausage as that just makes sense for breakfast (duh), and a lamb and meat farm shop nearby makes crazy good links (http://www.foxhollowfarm.org). Feel free to use any type of pear, bell peppers, potatoes, or stock, as well. Dividing this recipe into four servings gives each serving about 10% of your recommended daily fiber need just from the pears and potatoes. The bell pepper and nuts add even more! It’s a fiber bonanza on your plate, basically. Bon ap, to fiber! There comes a time in September when you can buy bulk fruit on the cheap in large baskets, crates, or whatever massive bin imaginable (yes, I’ve even seen fruit measured by the wagon-ful and then tugged away). In my mid-Atlantic region, the market stands usually then have mounds of peaches, nectarines, apples, pears, apricots, and other fruits of so many different varieties and colors. This year, I decided to bet on the plums. As others fought and negotiated over the Galas and Granny Smith’s, I thought that the dark plums deserved some wooing, so I paid about $1 a pound for a large basket full of the plushy stone fruits. Once back in my kitchen, and simmering on my stovetop, the sight of rising steam and sensations of stewed fruit smells reminded me of being back on the farm in France. Once the black currants ripened and harvest continued throughout one week in July, continuous pots of jam were made to sell throughout the year. As laborious as the process was, the pleasant aromas and filling jars was an overly rewarding to experience, preserving ripe fruit with lots of nutrients and flavor, to be spooned onto bread, ice cream, roasted meats, and other food companions. Plums are perfect to use to make compote as you can easily remove the skins and seeds, and the volume of juice from the fruit makes the final product an easily spreadable and versatile mixture. 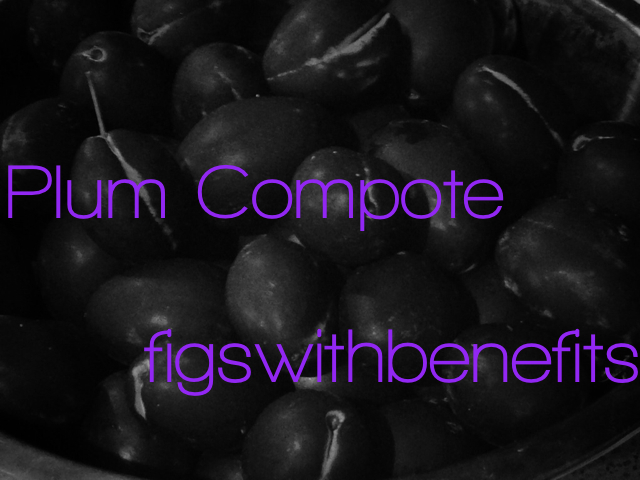 Plums are scarcely found in recipes or restaurant menus, so make this compote for a healthy, homemade fruit delicacy—a indigestion relief delicacy! There are many properties of plums that aid your digestive system, such as the compound sorbitol and fiber. Spices can enhance the compotes flavor and laxative benefits. So plums, meet nutmeg. Nutmeg is the seed of a type of evergreen tree, and pairs so well with the fleshy fruits. Sprinkling grated nutmeg onto your food will help relieve you from stomach aches as well as other digestive discomforts. Seems like these two musky tree branch sprouts need to make an amazing compote together! 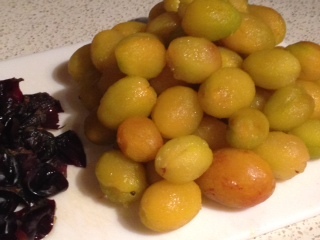 Place plums in a large bowl, or two medium sized bowls. Boil water in a kettle or a saucepan, and then pour over the plums. Allow to sit for at least 3 minutes. One by one, take plums out and peel off their skins. Remove their seeds and cut into quarters. Place fruit segments in a large saucepan. Add the sugar, zest, and lemon juice to the fruit. Bring to a simmer over medium-high heat, stirring occasionally. 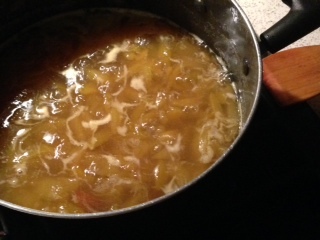 Simmer until fruit begins to fall apart and liquid is slightly syrupy, about 30 minutes. Remove from heat and stir in nutmeg. Transfer to a bowl to cool. Serve warm or at room temperature. Do not refrigerate until the compote reaches room temperature. As skinning and pitting the fruit takes time, I suggest making this recipe on the weekend or during an open evening when you want to spend time at home. This recipe is also great to make with a friend or the family, and then the compote can be shared among the helpers. I suggest serving warm on cake or ice cream, or room temperature on Pumpernickel Sourdough bread, baguette with butter, or on yogurt with granola. Bon ap, to digestive health! Use these beauties in my dish to give you a fiber kick. 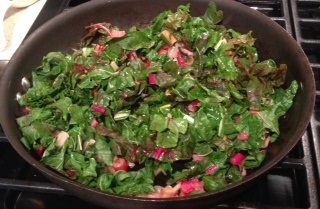 Rainbow chard is a great source for insoluble fiber, which helps move food through your digestive system. So if you’re feeling like your body needs some help processing the food you’re feeding it, allow this recipe to assist in your battle plan. 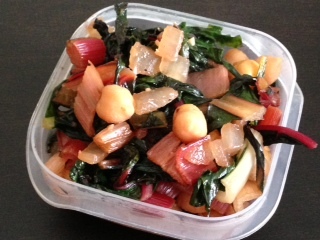 First, rainbow chard meet chickpeas. Both of these ingredients have the common makeup of having a substantial amount of insoluble fiber. If you are looking for a quick side dish that packs a punch, or you’re vegetarian/vegan, then my Raging Rainbow Chard can also become a favorite, especially when the rainbow chard is coming right off the farm! In a large frying pan, pour in oil. 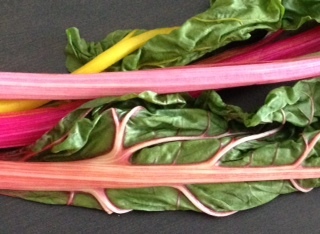 Separate stems from leaves of the rainbow chard. Divide stems in half. Use one half for another use (making stock, compost, animal feed, etc.) and then slice the other half. the slices should be about the width of your pinky finger. Set aside (look at the color!). Slide leaves about the same width. Wash in your salad spinner or colander. Start getting your pan hot over medium heat. Chop onion, then mince garlic and jalapeno. Add sliced stems, onion, garlic, jalapeno, and 1/4 tsp salt. Stir for about 7 minutes. If the garlic starts to burn, turn down the heat or stir more often. Meanwhile, in another small frying pan, add pine nuts of low-medium heat. Shake the pan from time to time to roll the nuts so they don’t burn. Heat until you start to smell them toasting, before they turn black on any of their sides. Remove from heat and put pine nuts on your cutting board or in a bowl. Once the onions are translucent, start adding the rainbow chard strips, in two batches, about two minutes apart, stirring continuously. Add 1/4 tsp pepper and 1/2 tsp salt. Bon ap to fiber and a healthy digestive system! You’ll feel great!